Walter Mosley talks about LITTLE GREEN. 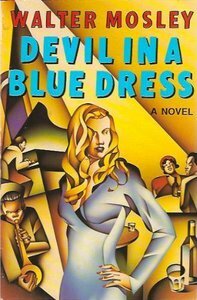 On this Date, in 1990, Norton published DEVIL IN A BLUE DRESS by Walter Mosley. The novel introduced the world to Ezekiel “Easy” Rawlins, a WW II vet turned PI. In the early books, Rawlins was simply looking to pay his mortgage. As the series went on, Mosley brought Rawlins from post-WW II L.A to the Red Scare and eventually to the revolutionary movement in the late 60s. The novel was well-received and won the Shamus Award (Presented by the Private Eye Writers of America) for Best First Novel. But it was not until then presidential candidate Bill Clinton declared Mosley one of his favorite authors. In 1995, Oscar-winner Denzil Washington ( along with Tom Sizemore, Jennifer Beals, and Don Cheadle) brought Easy to the big screen in Carl Franklin’s adaptation of DEVIL. Since that book, Easy has starred in another 12 novels and one collection of stories. The most recent Easy Rawlins novel, CHARCOAL JOE, was published earlier this week.